All jewellery made with plated metal (wire, beads, pendants) needs to be treated with care. The more it is worn and cleaned, the quicker the plating will wear off. Please only wipe the metal with a damp cloth or polish with soft lint free fabric. doing gardening or other 'dirty' work. All plated components can be replaced upon request. Most jewellery pieces can be made with solid metal if durability is a concern. We also have lots of solid copper, solid brass, sterling silver or stainless steel items in stock. Store in a cool, dry place. Silver tarnishes when exposed to air, so it's a good idea to keep your silver in airtight zip lock plastic bags or an airtight container when not in use. This will help to slow the tarnishing process and protect your jewelry from scratching. Remove when cleaning, swimming and taking a shower. Always remove your jewelry before using any product that contains bleach, ammonia, alcohol, fingernail polish removers that contain acetone, and turpentine. Some of these can cause a breakdown in the metal alloys leaving your jewelry beyond repair and dull or even pit the surface of your gemstones. Remove when sleeping. Movement during sleep can also cause stress. If possible, keep pieces separately, to prevent them from scratching each other. Don't wear your gold jewelry while bathing or cleaning. Soap won't harm gold, but it will leave a filmy residue that will coat karat gold jewelry, causing it to appear less lustrous and dingy. If you prevent the film from forming, it will be easier to keep your jewelry beautiful and will reduce cleaning time and effort. Avoid chlorine! Don't wear gold jewelry in the pool or hot tub or when using chlorine bleach or cleaners. Chlorine reacts with gold, particularly at high temperatures. Exposure to chlorine can permanently damage and discolor your gold jewelry. Avoid storing or otherwise exposing gold jewelry to hard, abrasive materials. Gold is a very soft metal, easily scratched even by rubbing against other jewelry. Before cleaning your jewelry, examine it carefully to make sure that all settings, clasps and prongs/claws are secure. 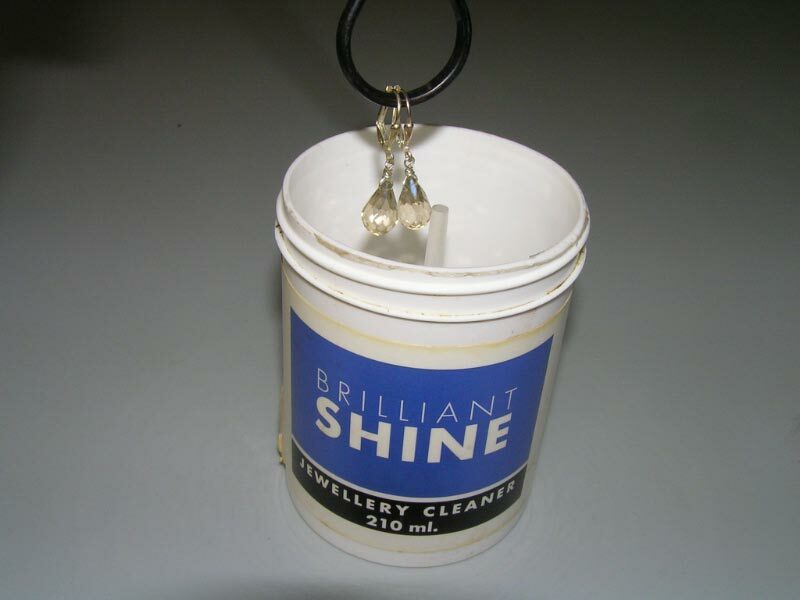 Tarnish can be removed with a commercial jewelry cleaner or with dish soap and water with a few drops of ammonia. Brush the cleaning solution into the gold with a small brush (a toothbrush works well). After you have finished cleaning, simply rinse the gold with lukewarm water (plug the sink first) and allow it to dry. Grease can be removed from gold by dipping it into ordinary rubbing alcohol. Ultrasonic cleaners may be appropriate for some gold jewelry. Ask a jeweler to advise you before using this method, since certain pieces can be damaged by this cleaning method. Sterling silver is an alloy of 92 1/2 percent silver and 7 1/2 percent copper. Its beauty increases with use, which causes a patina or soft sheen to form. Silver tarnishes when exposed to air. This occurs more quickly in damp and foggy weather, but is inevitable in any climate. Sulfur attaches to the silver creating silver sulfate, an unseemly grayish thing. Chemical applications and any abrasive cleanser/polish will actually remove the entire structure of silver sulfate from the surface, sulfur AND SILVER. To prevent that, use only non-abrasive cleaner. Without stones - you can use a dip cleaner, cleaning paste or cleaning cloth.Silver with deeply "carved" patterns that are enhanced by an oxide or French gray finish should be hand polished with a high quality silver cream or polish.Hand rubbing develops patina on silver which adds to its beauty. Ornamental silver pieces that have been lacquered may be washed in lukewarm water; hot water could remove the lacquer. Polishing silver while wearing rubber gloves promotes tarnish. Instead, choose plastic or cotton gloves. Rubber severely affects silver. Rubber corrodes silver, and it can become so deeply etched that only a silversmith can repair the damage. Raised designs can be lost permanently. Avoid using storage cabinets or chests with rubber seals, rubber floor coverings, rubber bands, etc. With soft stones: (Turquoise, Lapis Lazuli, Pearl, Opal, Malachite, Emerald, Coral, dyed beads ) only use a cleaning cloth.With hard stones(Quartz, Topaz, Sapphire, Diamond, Ruby), you can use all the above.Frequently wearing silver can prevent tarnish or store in treated paper or cloth, or plastic film. Baking Soda: Apply a paste of baking soda and water. Rub, rinse, and polish dry with a soft cloth. To remove tarnish from silverware, sprinkle baking soda on a damp cloth and rub it on the silverware until tarnish is gone. Rinse and dry well.Toothpaste: To clean off tarnish, coat the silver with non-abrasive toothpaste, then run it under warm water, work it into a foam, and rinse it off. For stubborn stains or intricate grooves, use an old soft-bristled toothbrush. 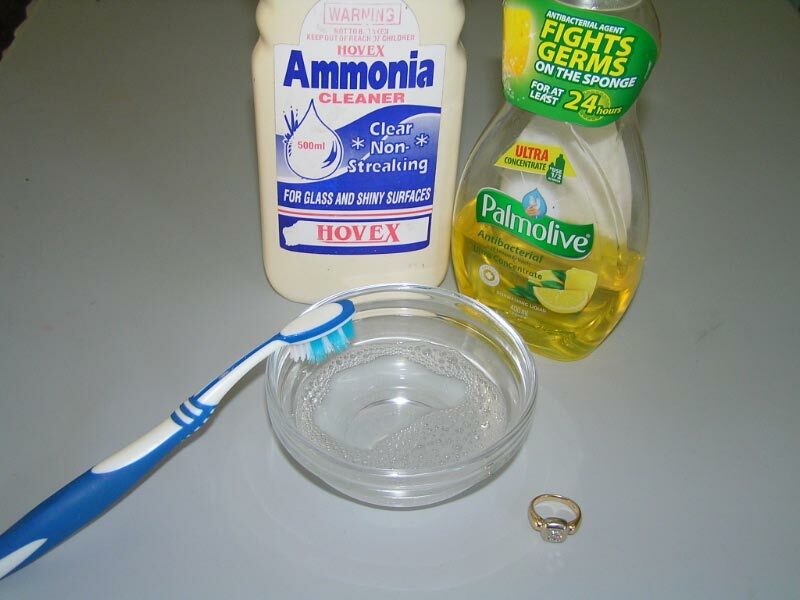 To dish soap water add some ammonia and brush with a soft tooth brush. Only use with hard gemstones. 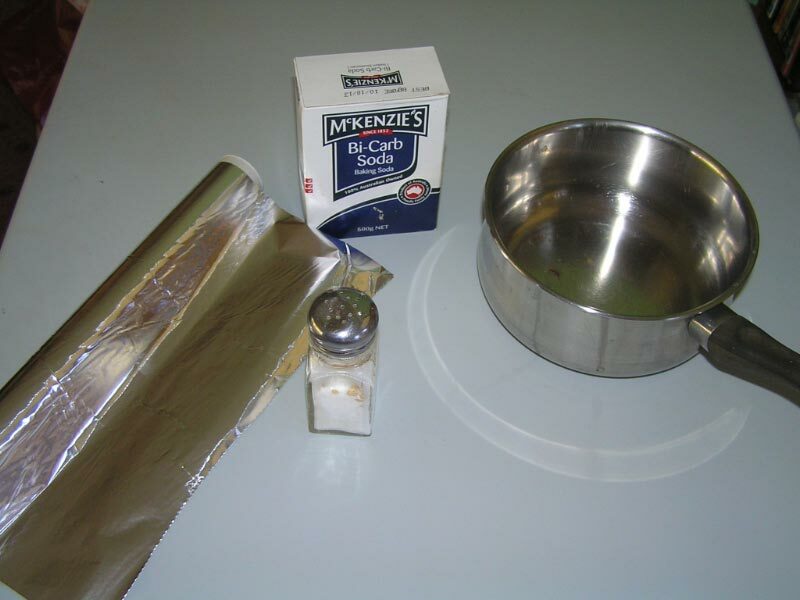 You will need a sheet of real aluminum foil, hot water, baking soda, table salt and a pan to do this in. Line your pan with a sheet of Al foil. Place the item to be cleaned on top of the Al foil sheet. Contact is a MUST. Into this hot water, dissolve a cup or two of fresh baking soda. Once dissolved and quite hot, pour this over the item - making sure contact is maintained between the item and the Al foil. The baking soda/aluminum combo pulls sulfur off the silver by a small electrolytic current set up through the "salt bridge". This is why contact with the aluminum is so important. Both Silver and Aluminum loves to accept sulfur, but aluminum does it quicker and will pull atoms of it off the item as long as the electrolytic current remains. The silver is left all alone again. The heat of the water is just a catalyst and makes the reaction occur faster. You will still need to polish the silver with a lint free cloth. Brass and copper components will patina over time. This is a natural occurrence. However, copper and brass are very simple to care for. While they do tarnish more quickly than sterling silver, they can be restored to their original shine easily. Put jewelry in a solution of warm water, a bit of lemon or limejuice (or vinegar) with a dash of salt, leave in for a couple of minutes and rinse.Worcestershire sauce does a great job of cleaning copper and brass jewelry. This method should not be used with gemstones or pearls that cannot be cleaned with chemical cleaners, as the acid in the sauce may affect more delicate stones. You can also cover it in tomato sauce, let it sit for a couple of minutes and rinse. The acid in the tomato of the ketchup shines up copper and brass quite nicely. This method can be messier than the Worcestershire. Apply it with a toothbrush or soft cloth, then rinse thoroughly. Avoid getting ketchup on the same types of stones as should not be used with chemical cleaners. Use this only for the metal, not for gemstones. Use a jewelry polishing cloth around the gemstones. Mystic Gemstones should be handled with the same care as opals and pearls. The thin film treatment applied to gemstones producing beautiful iridescent colors that are quite durable and hard. The treated layer is only microns in thickness; it is not deposited in thick layers. If the wearer utilizes care, the enhancement will last the life of the jewelry setting. However, the enhanced gemstone should not be exposed to any abrasives, acids, or immersed in an ultrasonic cleaner. Ultrasonic cleaners may contain a pickling solution that would cause damage to the enhanced surface of the gemstone. Abrasive cloths may scratch the enhanced surface of the gemstone. This may not remove the treatment, but scratching the optical surface will effect the reflection of light traveling through the gemstone. This influences the color and clarity of the gemstone. High heat may adversely affect the refractive index: eliminating color-intensity. Heat should NOT be applied to the enhanced surface of the gemstone. Cleaners: We advise to use only cleaners that are safe for pearls or opals; more specifically, "Windex" and "Jewel Brite" to clean the enhanced gemstones. A mild soap and water rinse also works well. Simply wash off the dulling surface oils and blot dry with a clean paper towel. This will restore the colors to their original luster and brilliance.